• One-touch brew operation with auto-off. • Powerful and precise 1500-watt heater maintains optimal brewing temperature of 195°-205°F (91°-96°C). • Optional pre-infusion mode wets freshly roasted ground coffee to allow degassing before brewing. • Flat-bottomed filter basket and larger showerhead allow for even better saturation and uniform extraction. • Durable stainless steel-lined thermal carafe. • Carafe lid, filter basket, and showerhead are dishwasher-safe and all plastic is BPA-free. The ingredients for great coffee are simple: fresh coffee, pure filtered water, and you. Simple operation means it's easy to brew a quality pot of coffee every time. 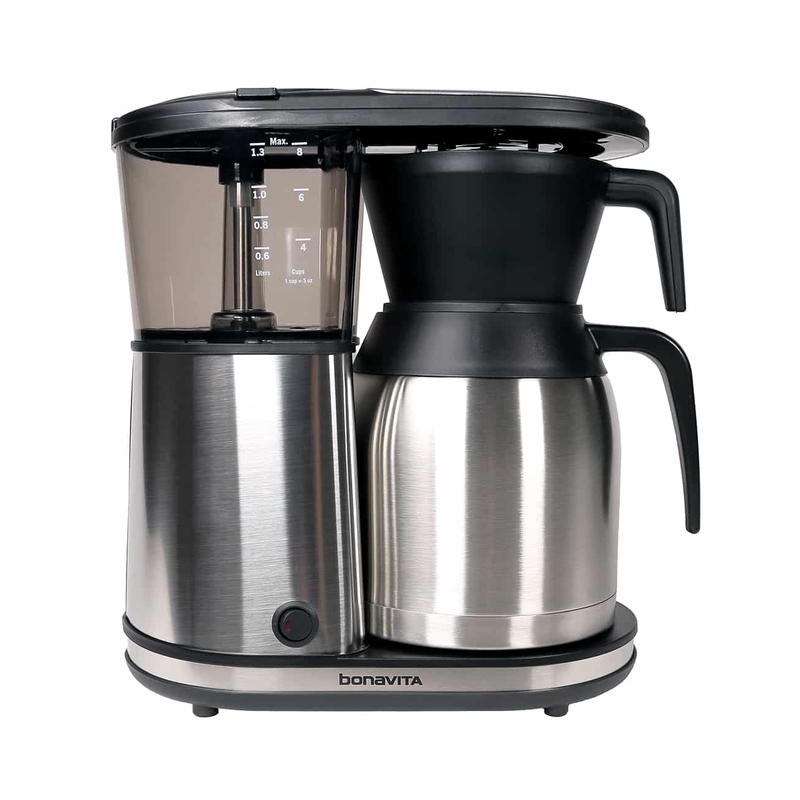 The Bonavita 8-cup brewer features one-touch brewing and automatic power-off. A crucial step in brewing great coffee is reaching, and maintaining, the optimal water temperature. Water that's too hot or too cold produces an imbalanced flavor profile and other undesirable qualities. Bonavita brewers are fitted with a powerful and precise heater that reaches the optimal temperature quickly and maintains that temperature throughout the brew. This results in faster brewing and, of course, delicious coffee. Bonavita's wide showerhead design evenly distributes water over the coffee grounds to ensure uniform extraction. The showerhead works in harmony with our precise flat-bottomed filter basket to ensure even saturation. The result is an optimal flavor profile at your desired strength.